"So I feel like I am using my Instant Pot® at least 4 times a week. I have been having a great time experimenting and am amazed at the way the flavors are locked in and how quickly the meals are finished... not to say the super easy clean up. The main insert can go in the dishwasher and I hand-clean the top with very sudsy water." Heat oil in a multi-functional pressure cooker (such as Instant Pot(R)) on Saute mode. Add beef and onion; cook until beef is no longer pink on the outside, about 4 minutes. Add celery, green beans, carrot, garlic, oregano, dried basil, and pepper. Stir to combine. Pour broth, diced tomatoes, and crushed tomatoes into the pot with the beef. Stir well. Select Soup setting; close and lock the lid. Select high pressure according to manufacturer's instructions; set timer for 35 minutes. Allow 10 to 15 minutes for pressure to build. Release pressure carefully using the quick-release method according to manufacturer's instructions, about 5 minutes. Unlock and remove the lid. Stir in kidney beans and pasta. Turn on Slow Cook mode and cook until pasta and vegetables are tender, about 10 minutes. Season with salt. Ladle soup into bowls and top with Parmesan cheese and fresh basil. 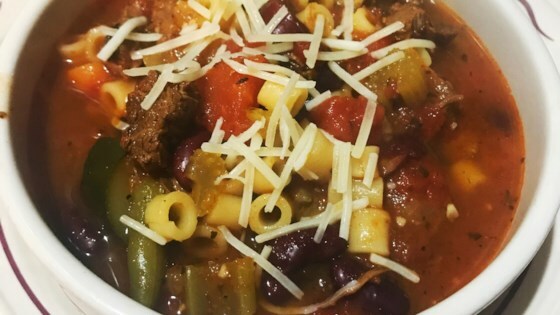 See how to make classic, comforting minestrone soup. Amazing soup! I was able to substitute frozen soup veggies with no problems. This will be a family favorite!